Search configuration files are in the Search folder: search.ini, searchf.ini. 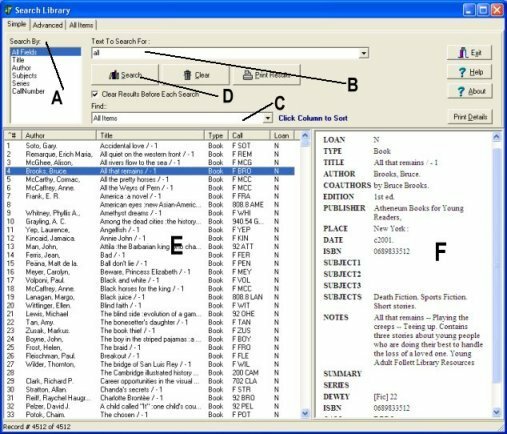 Library Search Utility (OPAC): is a stand-alone application. Search Utility allows you to process search transactions without launching Organizer Pro software. Your Organizer Pro databases are protected from unwanted modifications or deletions. Search Utility can be used on one computer or on the network. The application Search function helps you to locate records that contain the piece of data you are looking for. 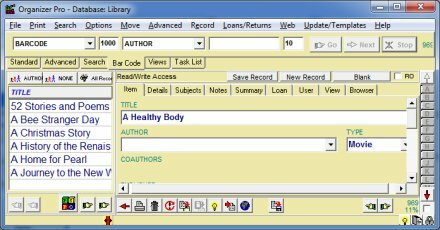 With this software, you are able to locate a piece of text in any field with the capability of moving to the next record filling your search criteria. The Replace function helps you to replace the entire or the part of the field's content with a new value. This function is useful for users who want to make global changes on the selected field in the entire database. Example: use replace feature to create book barcode/id values for all your records. The Bar Code Search function helps you to locate the record which has been assigned a particular barcode (or any number in the text form). Simply scan the barcode (or enter manually) and the program finds the record automatically. Find Duplicates: this function allows you to display and/or delete duplicate library records based on a selected data field. For example, you can easily find and eliminate records with the same book title. Non Stop Search: the library software goes through entire database looking for records that match search criteria. When the search is finished ONLY those records are displayed that contain the text.